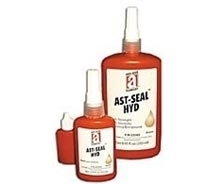 AST-SEAL™ HYD is an excellent sealant for straight metal threads and created to withstand hydraulic system pressures. It also exhibits high-temp and solvent resistance to water and non-polar solvents. Not for oxygen use. Applications: For use on refrigeration, hydraulic and pneumatic systems.